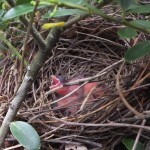 Baby cardinals, so hard to find, have a weird red tint to their bodies. After years of looking I finally found a nest. The babies left before I thought they could make it. I’ll never know if they did.